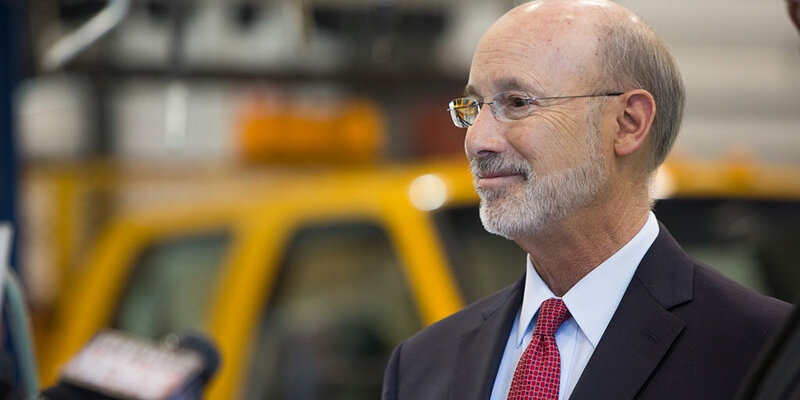 Harrisburg, PA – Governor Tom Wolf today announced that 45 highway, bridge, bike and pedestrian, and ports and waterways projects will benefit communities in 22 counties through the Pennsylvania Department of Transportation (PennDOT) Multimodal Transportation Fund. The $41.5 million investment follows PennDOT’s evaluation of 222 applications requesting more than $241 million. The department made selections based on safety benefits, regional economic conditions, the technical and financial feasibility, job creation, energy efficiency, and operational sustainability. Sharpsburg Borough — $1.5 million to reconstruct 19th Street to the Riverfront 47 development, including intersection upgrades, signal installation, overpass and retaining wall removal, retaining wall construction, 19th Street reconstruction. Bellevue Borough — $315,000 for improvements to the West Riverview Avenue retaining wall that will eliminate emergency access safety issues and traffic flow inefficiencies that exist currently due to a partial road closure resulting from the collapse of a portion of the retaining wall. Borough of Brentwood — $65,000 for the improvement of approximately 18,000 square feet of sidewalks. Homestead Borough — $100,000 for a one-mile trail and bike park to connect to the Great Allegheny Passage Bicycle Trail along Waterfront Drive enabling safe access to “The Avenues” Business District, which spans three municipalities (West Homestead, Homestead, and Munhall). Borough of Castle Shannon — $1.6 million to create linkages between the three transit stations in Castle Shannon (Shannon, Willow, and Arlington) as well as the Shannon Transit Village transit-oriented development (TOD). The project will improve conditions surrounding the new TOD with new lighting, sidewalk enhancement, pedestrian safety, improved sidewalk connections, crosswalks and more. Friends of Pittsburgh Professional Soccer — $500,000 for transportation improvements that will support the Montour Junction Sports & Athletic Complex that will provide safe access for bicycles, buses, and pedestrians. McKees Rocks Harbor Services, LLC — $638,015 for construction a 12-barge fleeting area 300 feet upstream of the new dock at McKees Rocks Industrial Enterprises (MRIE), which has doubled the capacity of MRIE’s existing dock. Metalico Pittsburgh, Inc. — $400,000 for dock rehabilitation, including the installation of approximately 225 linear feet of sheet pile wall, which will repair the dock to allow for river barge loading capabilities for another 20 years. Berks County: Berks County Industrial Development Authority — $700,000 for intersection improvements at Aviation Road and Route 183 to support an industrial park that will create 500-600 jobs. Bristol Borough — $572,307 to support replacing a decommissioned bridge along Maple Beach Road to provide safe access to Maple Beach, the borough’s wastewater treatment facility, and one of Pennsylvania’s only freshwater tidal marshes. Lifequest — $1.5 million to widen Route 663 going into Route 309 and add a new mile-long pedestrian/bicycle pathway. University of Pittsburgh at Johnstown – $500,000 to construct a trail and sidewalk to improve the pedestrian connection between the 8,000 people at the university, Penn Highlands Community College, and the Richland School District. Portage Borough — $440,905 for the second phase of a multi-phase streetscape program to establish pedestrian connectivity and improve pedestrian safety through installation of new lighting, sidewalk connections, crosswalks, and signs. Borough of Phoenixville – nearly $1.3 million for reconstruction and extension of Ashburn Road 0.34 miles from where Ashburn Road ends to Township Line Road. Fair Share Properties, LP — $750,000 to construct a new connector road and pedestrian/bicycle path which will enhance the safety and accessibility of two major intersections along U.S. 202, support walkability, and provide children access to safer routes to school. The proposed connector road and path will be directly west and run parallel to U.S. 202, connecting West Pleasant Grove Road and Stetson School Drive. Oxford Borough — $143,836 for roadway and pedestrian infrastructure improvements to address poor road conditions, including reconstruction and restoration of Second Avenue (between Locust and Mt. Vernon Streets) and Octoraro Alley (from Second Street to the entrance of the new transit center) in anticipation of a new transit center in the downtown. New Garden Township — $2 million for improvements to the Baltimore Pike/Newark Road intersection, including signal modernization with pedestrian signals and emergency preemption, road realignment and widening, new turn lanes, increased turning radii, ADA-compliant sidewalks and crosswalks, and access management. Clarion County: Millcreek Township — $157,500 for replacement of Asbury Bridge, a structurally deficient/weight limited bridge that currently restricts emergency, commercial, and recreational vehicles from utilizing a key portion of both Clarion and Millcreek townships. Clearfield County: City of DuBois — $670,000 to extend walkways on both sides of South Main Street, North Main Street and DuBois Street beginning at Grove Avenue and terminating at Hamor Street. Clinton County: Chapman Township — $380,000 for the rehabilitation of Bucktail Bridge, including replacement of the concrete deck and rehabilitation of the sidewalk and approaches. City of Harrisburg – nearly $3 million to improve the vehicular, transit, pedestrian, and bicycle movements within the city north of the Capitol Complex and to address several transportation-related safety issues. A total of nearly $4.5 million is committed over the next two years for this project. Susquehanna Area Regional Airport Authority — $482,548 for the rehabilitation and reconstruction of Airport Drive, the exclusive connector road between Route 3032 (Airport Connector) and the Ann Street Bridge at Route 230. Media Borough — $60,957 to implement the Borough’s 2016 Wayfinding Signage Master Plan, installing a comprehensive borough-wide signage system. Marple Associates, LP — $1 million for on- and off-site roadway and signalization improvements to PA Route 3 and I-476, including intersections with Lawrence Road and Langford Road to include new roads and the installation of new traffic signals and interconnection with existing signals. Erie County: City of Erie – nearly $2.6 million for streetscape improvements to the West 8th Street corridor, including replacing the pavement; installing curbs, sidewalks, and LED lighting; improving bicycle and pedestrian accommodations; planting trees; and improving traffic signals. Jefferson County: Bell Township — $823,839 for reconstruction of Airport Road to provide improved access for residential and commercial vehicles and improved safety and accessibility for multimodal traffic. Lancaster County: Warwick Township — $1.9 million for the extension of Sixth Street, including implementing traffic calming measures and increasing motorist, bicycle, and pedestrian safety for the growing population in the greater Warwick/Lancaster area. Lehigh County: Borough of Coopersburg — $175,000 for traffic and pedestrian improvements to Route 2045 (Main Street), including pedestrian crosswalks and handicap accessibility at seven key intersections, as well as 0.27 miles of curb, sidewalk, and pedestrian lighting. Hazle Township — $558,435 for full-width milling and overlay of Old Airport Road, constructing a new bicycle lane, and drainage improvements near Hazleton Regional Airport. The Greater Wilkes-Barre Industrial Fund — $301,774 to install new sidewalk and curbing along East Carey Street from the intersection with North Main Street to the intersection with Delaware Street, replace existing inlets, curbing, and sidewalks, and install detectable warning surfaces for curb cut ramps, driveway aprons, permanent pavement restoration, and permanent hot thermoplastic white lines on the new pavements for cross walks, the new center lane, and stop bars. Lycoming County: Williamsport Area School District – nearly $1.2 million to replace and upgrade the access road (Millionaire Drive) to Williamsport Area High School, including replacing all inlets, manholes, headwalls, drainage pipes, and curbs; excavating and replacing some areas of roadway; milling and resurfacing the entire roadway; and installing a sidewalk/bike path. Mercer County: City of Sharon — $820,441 for the mill and overlay, curbs and ramps of 13 roads in the City of Sharon. Horsham Township — $3 million for capacity and multimodal improvements at the intersections of Blair Mill Road/Witmer Road/Commerce Avenue and Blair Mill Road/Route 611. Lower Providence Township — $2 million for improvements to the Park Avenue/Eagleville Road/Crawford Road intersection, including aligning the minor approaches, installing a new traffic signal, widening for left-turn lanes, and ADA/pedestrian upgrades. Lower Gwynedd Township — $937,700 for improvements to Spring House Roadway, including roadway widening, pedestrian upgrades, and traffic signal improvements to improve traffic flow and efficiency through the Bethlehem Pike, Norristown Road, and Sumneytown Pike intersection. Gwynedd Mercy University — $372,260 to address multimodal hazards at the intersection of Evans Road and the campus’s main access point. Northampton County: City of Easton — $450,000 for improvements to Wood Avenue, including eliminating cross traffic on seven of the 13 intersections, adding traffic calming measures to the other six intersections, implementing right-hand turns only, and restricting parking to one side of the street. City of Philadelphia Streets Department — $1.1 million to improve the intersection geometry in the southwestern corner of Adams/Summerdale Avenues and Roosevelt Boulevard to mitigate the conflict point between pedestrians and vehicles. VTR LS Development, LLC — $1.5 million for construction of a new street, linking a to-be-constructed street grid (located on the former University City High School site in West Philadelphia) to Market Street. Logan West Associates, LP — $1 million for improvements to Logan Point Roadway to prepare the Logan Triangle in North Philadelphia for redevelopment by vacating a series of unused, dilapidated streets, and completely reconstructing the arterial access roads, 9th Street and Wyoming Avenue. The Philadelphia Museum of Art — $3 million to support improvements to Anne d’Harnoncourt Drive, including new multimodal connections to Kelly Drive, a new school bus entrance for K-12 museum visitors, enhanced mass transit stops, re-engineered vehicular and pedestrian connection with improved safety features and traffic flow, new lighting and landscaping, permanent ADA ramps, and improvements to encourage biking and pedestrian use. Schuylkill River Development Corporation — $183,750 to install enhancements to the new Bartram’s Mile trail and greenway, including installation of an irrigation system and maintenance facility and contextually sensitive additions to the site landscaping. City of Philadelphia — $567,774 to purchase and install 21 additional bike share stations at strategic transit hubs within Central Philadelphia. Susquehanna County: Forest City Borough — $273,000 for a streetscape project along the east side of the 400, 500, and 600 blocks of Main Street, including replacement of concrete sidewalks and installation of pavers, shade trees, and decorative period lighting. Wayne County: Wayne Economic Development Corporation — $252,966 to pave and complete Innovation Drive in Sterling Business Park, Sterling Township.